Coffee cake is a classic and traditional cake that is paired or flavored with coffee. 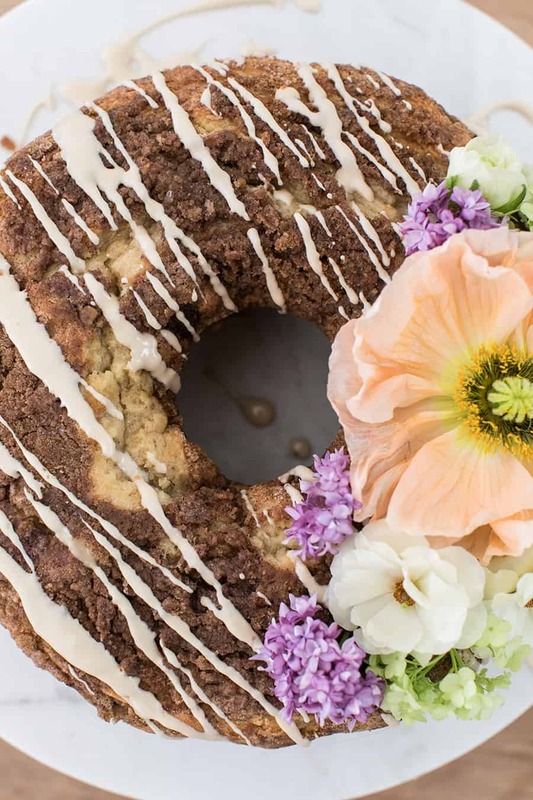 Personally, I think the best coffee cake is one that made with coffee and paired with it too! I like to add in a little espresso and then of course, enjoy a slice with the perfect cup of coffee. 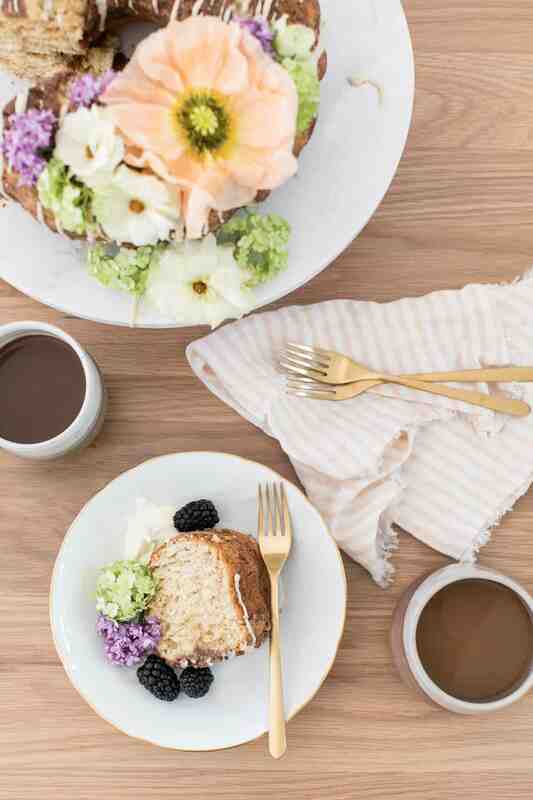 I named this recipe Spring Coffee Cake because I think it’s perfect for an afternoon tea party or outdoor brunch! It’s moist and crumbly just like coffee cake should be and very flavorful with the espresso we added to the recipe. We also used sour cream, which is traditional to American coffee cake, to keep it moist and give it a little bit of a tart flavor. 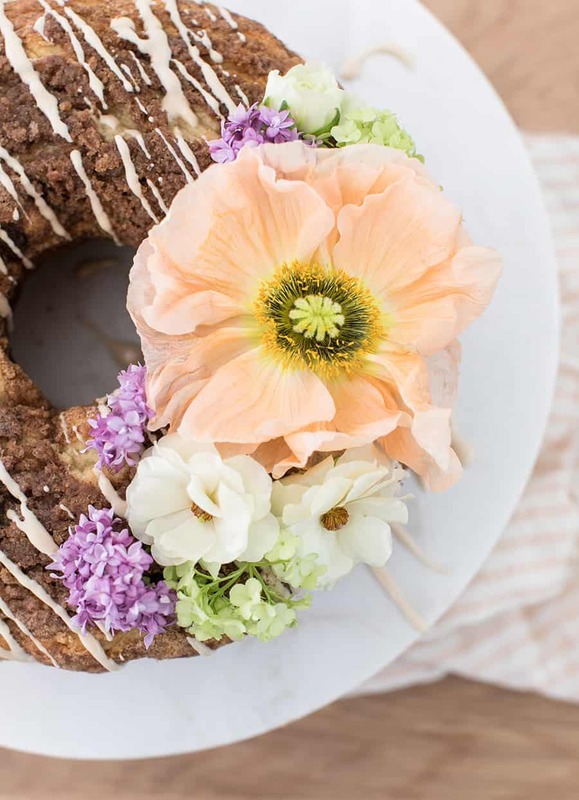 It feels very spring with the light coffee glaze and then garnished with flowers. If you like coffee cakes, try this coffee cake recipe and let me know your thoughts!! Cream together 12 tablespoons butter and sugar on high until light an fluffy. Add in 1 egg at a time and beat until incorporated. Add in the vanilla, sour cream and espresso and continue to beat on medium, scraping down the sides and the bottom of the bowl. Turn the mixer to low and add in the flour, baking soda, baking powder and salt. For the streusel, combine ½ cup brown sugar, 1½ teaspoon cinnamon, 1 tablespoons cold slated butter cubed and ½ cup flour. Use your fingers to break up the butter and make a crumbly texture to combine. Crumble the streusel over the batter evenly. The more the better! Bake for 30-35 minutes and let cool before removing from he pan. In a small bowl combine all of the ingredients and whisk until fully combined. 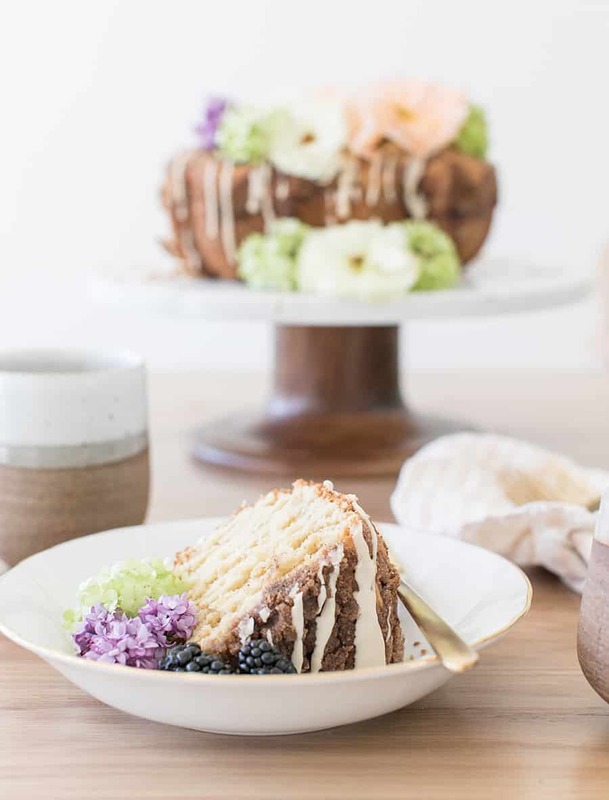 The texture should be a glaze finish that you can drizzle on the coffee cake.